This post has taken us much longer to write than we had planned. 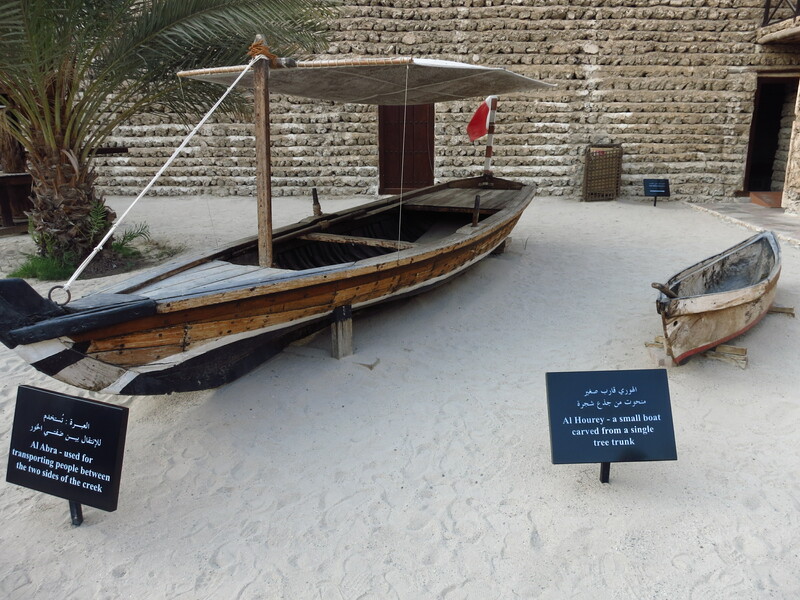 So recapping, day 1 of our time in Dubai was spent learning about its history and visiting Old Dubai! And now, day 2 was to visit what Dubai has turned into! We had opted to try a Hop On Hop Off Big Bus tour. We have never done this type of exploration of any city during the 9 years we have travelled. And the experience made us feel a little touristy. Here we were sitting in a double decker bus with our head phones plugged in, listening to English commentary (with choice of 9 other languages). 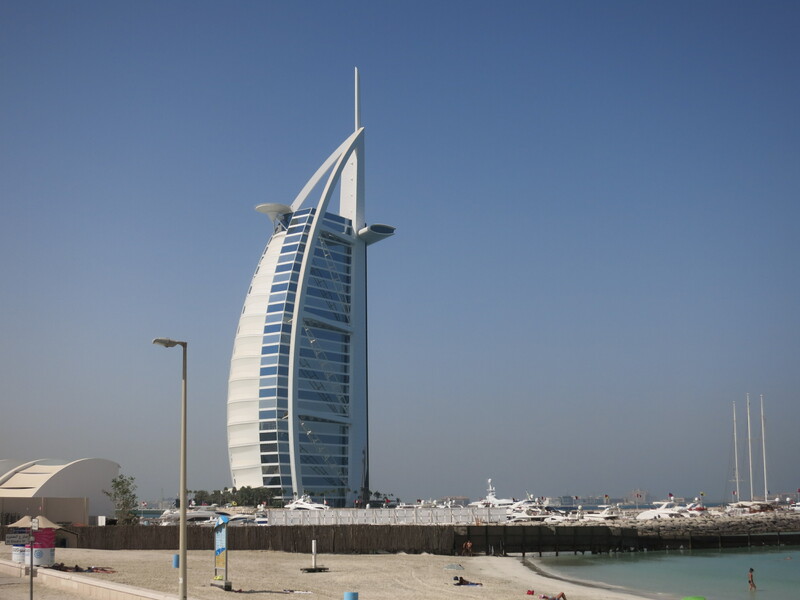 Dubai is really spread out so to see what we thought we should see, we figured this would be the quickest and easiest way. Plus, we had heard advice this was a good way to do it. We don’t disagree. Included with one ticket (220 Dirham for 24 hours or 295 Dirham for 48 hours), there were two routes: a red one and a blue one. The blue route would take us to all the big malls, famous hotels and man-made islands that we so often hear about. We picked this route first as the red one visited a lot of places we had seen the day before. 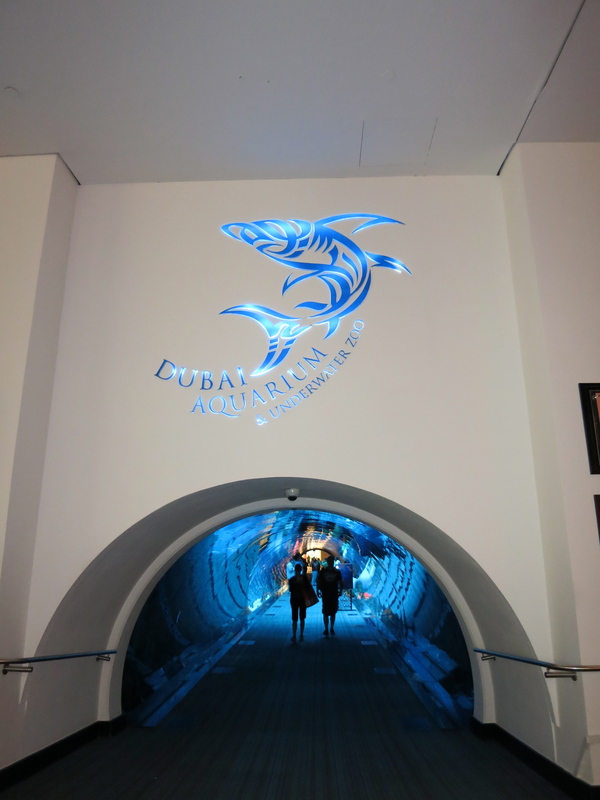 There was also the option of upgrading to a “combo” tour which was a day and night ticket (total = 295 Dirham) which included a panoramic night tour with a Sound & LIght show at Wafi. We chose this option as we figured it would be a nice way to spend our last night. The stops in “blue” were where we visited on this trip. Yes, two malls and that was our day gone. But before you judge us for “just shopping” all day. We didn’t actually get to much of that at all. The air-conditioned malls are great refuge from the searing heat outside and that is, in fact, their purpose… along with being a place of entertainment. 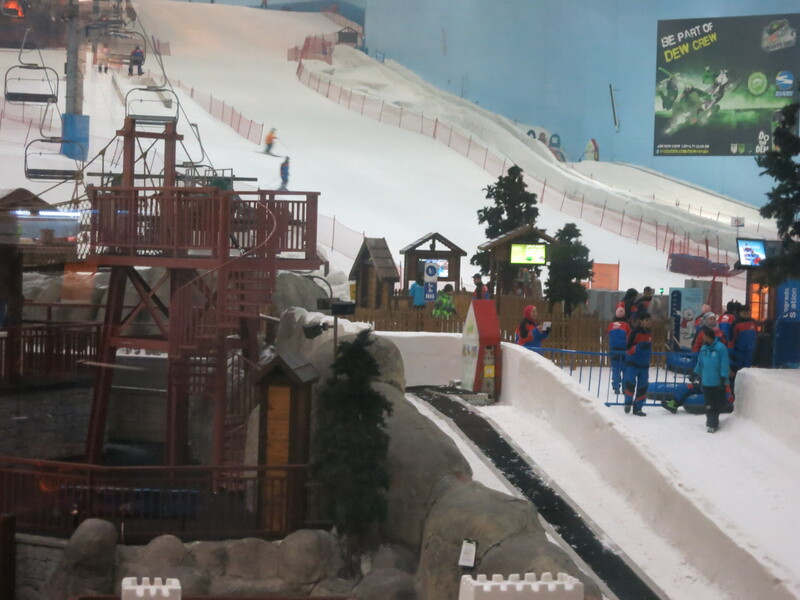 In the Mall of the Emirates, we had lunch at a restaurant overlooking the indoor ski slopes. We spent a lot of time people-watching and feeling it was all too surreal to be witnessing indoor ski slopes. 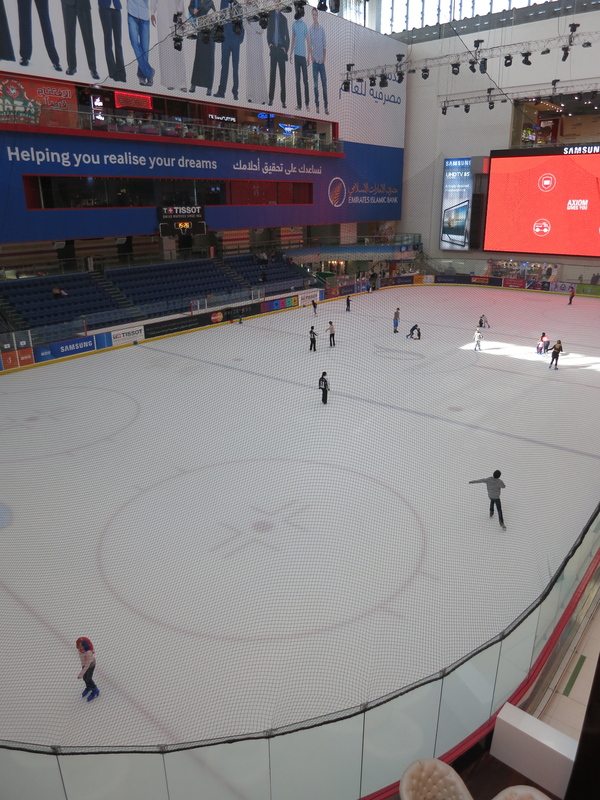 Then we just kept walking around and around the mall, quite aimlessly, until we finally decided that we needed to get OUT so we could move onto the next stop, The Dubai Mall. Now, this was where we lost A LOT of time. Dubai Mall has the Burj Khalifa Observation Deck, Olympic-Size Ice Rink, Dubai Aquarium, The Dubai Fountain and a Gold Souk. We made a bee-line to see the aquarium (tickets purchased through the Big Bus operators) however upon entering the mall, we were welcomed with such icy cold air that we had to purchase ourselves a sweater each. How utterly ridiculous that we were in the desert and needed a jumper to escape the cold of the mall!! We are embarrassed to even confess that. Anyway, the admission ticket gives access to two attractions: the aquarium and the Underwater Zoo. 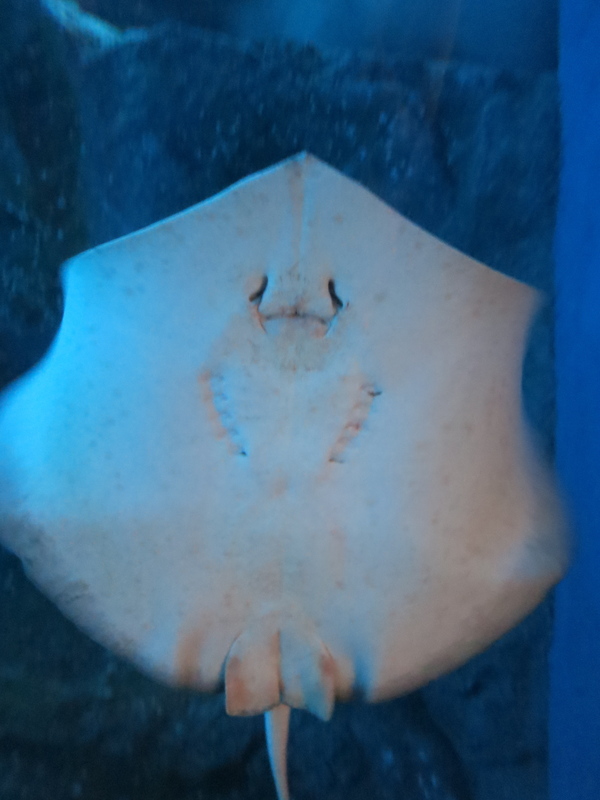 Not the best aquarium or wildlife park we’ve visited but pretty cool that they’re within a mall. Before we knew it, we needed to head back to the hotel. Drop off our shopping, grab some dinner before we picked up the night city tour. 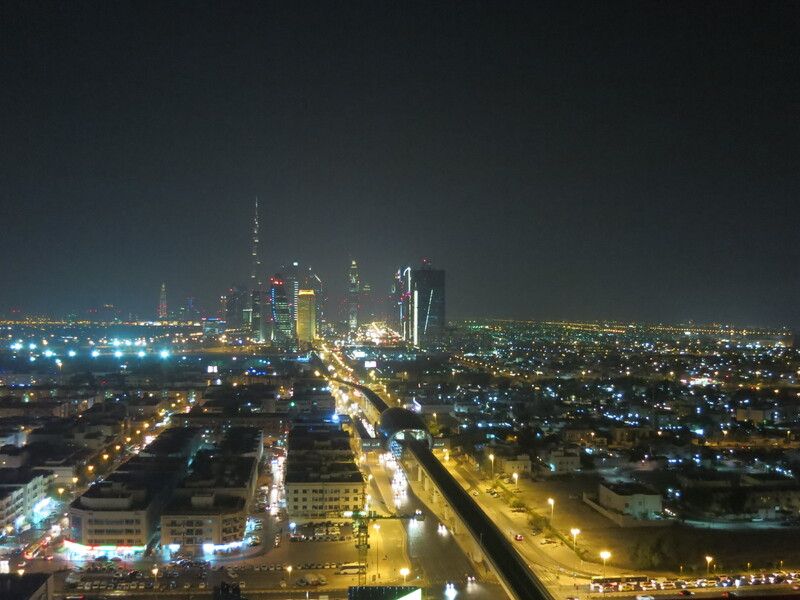 Dubai looks pretty impressive of a night. 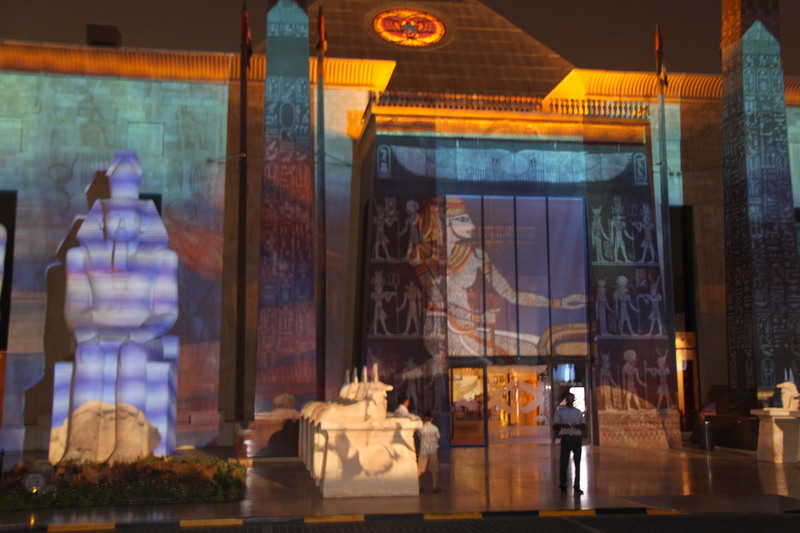 The 15 minute sound & light show at Wafi was a little anti-climatic though. 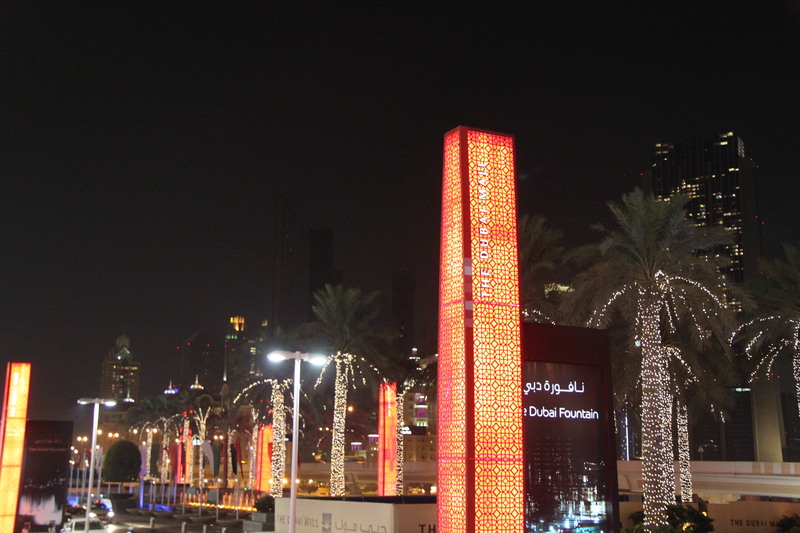 The night city tour definitely showed us Dubai in a different light (no pun intended) and was accompanied with live commentary, therefore no headphones needed – YAY! Here are a few photos of the night. We had toyed with the idea to do the 4WD sand dune safari and desert dinner for one of our nights here but the temperature was just too hot, we couldn’t imagine being outdoors for any longer than we had to plus we ran out of nights! Guess one day we will have to try that….either back here in Dubai or in another Middle-Eastern country! Overall, Dubai was NOT our cup of tea. It is not a place we look for when we travel. Yes, there is great hospitality and lots of luxury. And yes, there are shops. And yes, the city probably holds the most world records for the tallest building or most expensive cocktail but that wasn’t enough to win us over. 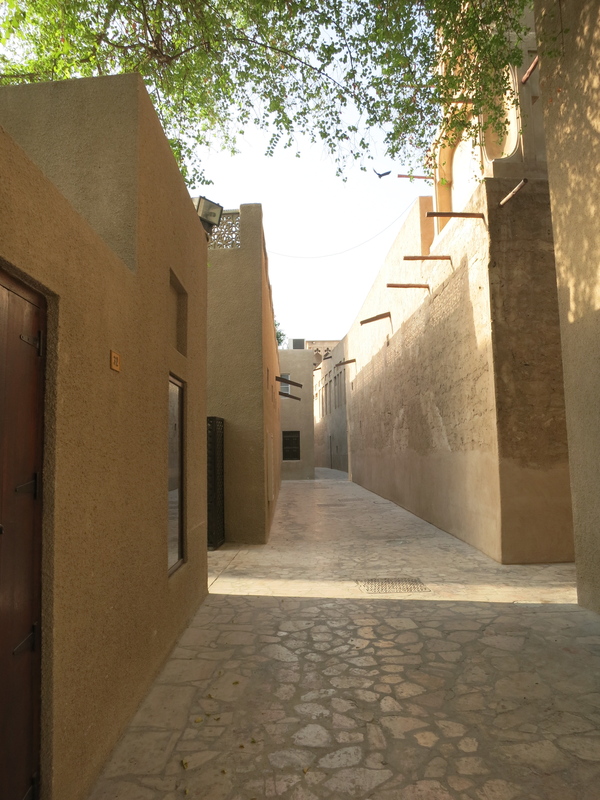 If it wasn’t for Old Dubai, we probably wouldn’t have enjoyed our 3 night stay. 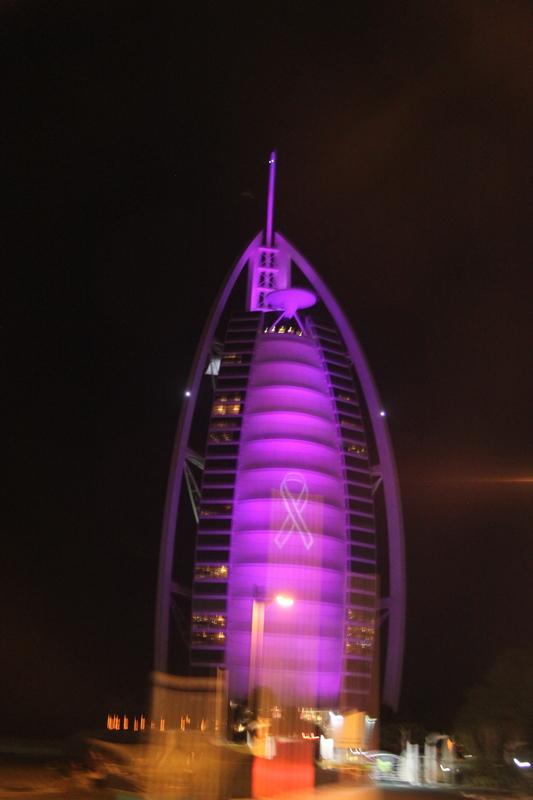 This entry was posted in Dubai (UAE) and tagged Burj Khalifa, Dubai, Dubai Mall, Mall of Emirates, Middle East, United Arab Emirates. We’ve been back for over a month and it seriously feels like we’ve never been away. How does going back to work do that to us? 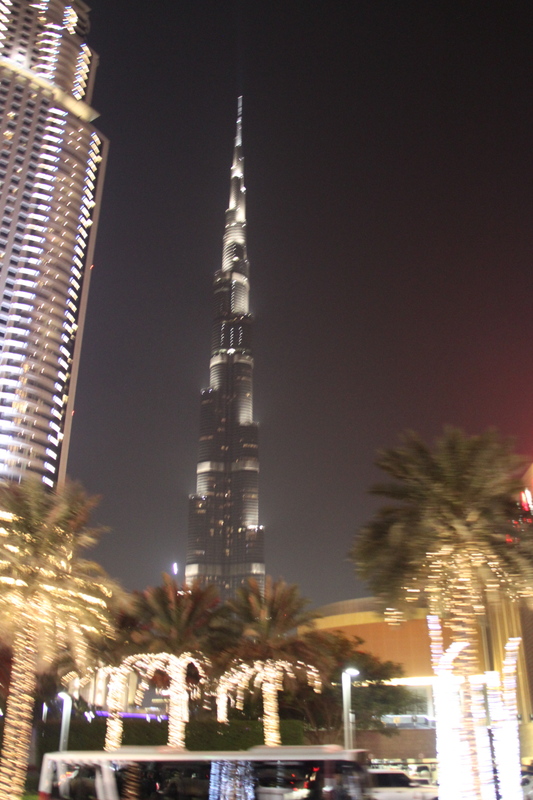 And we’ve written a few posts about Turkey but still yet to cover another part of that trip; Dubai. So what is there to do in Dubai? This is what we did in our 2 days stopover. 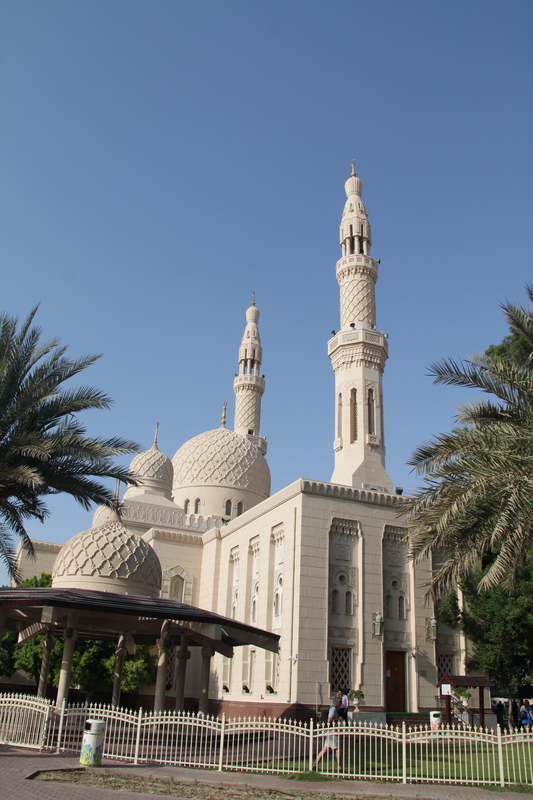 We arriving late on the Tuesday night (Day 0) and had booked everything with our Emirates flights as part of the “Arabian Adventures” 3-night stopover. It was our last ditch at feeling “away” before we flew back to Sydney. The package was a VIP welcome before customs (which was really a “hello” and “this is where you go for your hotel transfer”) with a Welcome Package and complimentary transfers to our hotel, Park Regis Kris Kin. We were told to sit and wait for our names to be called…. everybody turning up after us were being transported off but we sat and waited and waited and waited. Finally, we got to our hotel which was amazing and super comfortable (we have reviewed it at Tripadvisor). After a day of flying from Antalya to Dubai via Istanbul, we were exhausted so were happy to just crash on that first night. According to our package, before the pre-arranged (as part of this stopover package) City of Merchants tour, we were meeting a representative at midday at the hotel. This meant our Wednesday morning would not be as productive as we had hoped. 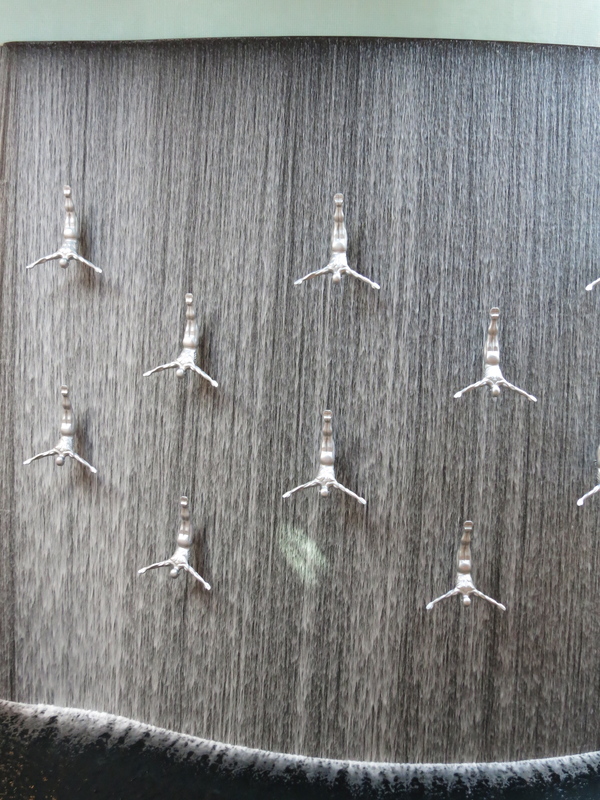 So we spent the morning exploring our first mall in Dubai. The walk from the hotel was 5-7 minutes but goodness, the heat was unforgiving and we were relieved to hit the air-conditioning. The mall was filled with luxury brand shops but not with many shoppers. It did get us questioning how there could be so many malls yet not all the malls be busy? We later learned malls were a form of air-conditioned entertainment to escape the searing heat of the desert. Meeting our representative at noon was extremely pointless because she provided no additional information than what was provided in the Welcome Package – so that was the biggest waste of our time. We were beginning to get a little unimpressed with the service we were getting from the Arabian Adventure representatives. However, they were able to redeem themselves with the City of Merchants tour. The tour guide whose name escapes us now (dammit!) was extremely entertaining. We also received bottled water every time we climbed back on the coach. They were very conscientious about not letting us dehydrate! 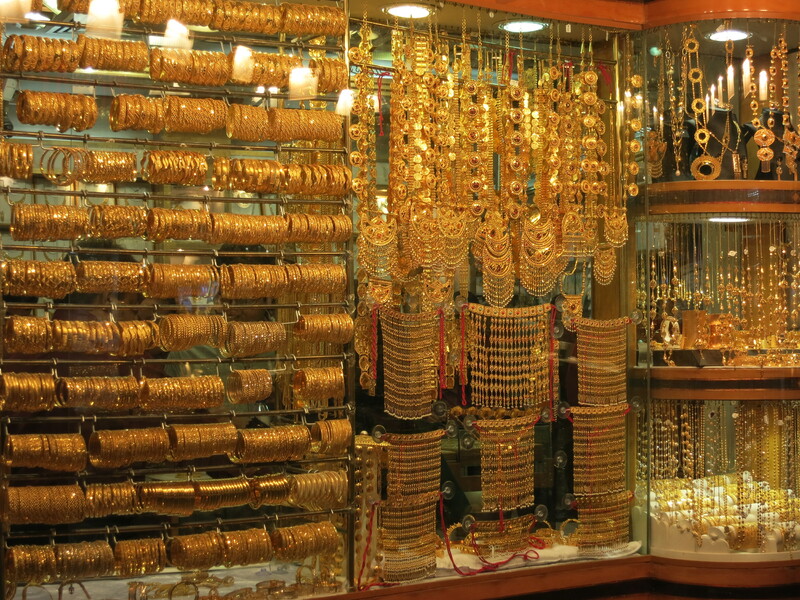 (7) to visit the spice and gold souks as our last stop. We arrived back at our hotel by way after 8 pm and yearning for a nice cool shower before seeking somewhere to eat dinner. That was 24 hours in Dubai gone. Day 2 was to be spent exploring the modern part of Dubai, so a good night sleep was needed! This entry was posted in Dubai (UAE) and tagged Arabian Adventure, Burj Al Arab, Dubai, Emirates, Hotel, Jumeirah Mosque, Middle East, United Arab Emirates.